Modern web and mobile applications demand interactive real-time experience. When a friend sends you an email in Gmail or a message with WhatsApp, you want these to pop up immediately, whether you're watching it on the relevant website or mobile application. When you browse through your Facebook news-feed, you want to see new Like events, new comments and new posts by your friends immediately as they happen, without waiting and without hitting 'refresh'. If you are web developers, you are probably aware of the complexity of trying to implement real-time push notifications yourselves. Modern web frameworks and platforms allow you to easily build rich and dynamic web applications, but usually don’t include easy to use, scalable solutions for real-time interaction of web visitors and mobile app users. Therefore, if you haven't done so already, you should try out PubNub. PubNub is a very powerful yet easy to use cloud service for real-time applications and push notifications. With a few lines of code you can extend your web and mobile apps with a fast, highly scalable solution for real-time notifications. PubNub allows sending real-time messages to a channel that multiple users can subscribe to. Cloudinary's image uploading can be performed directly from a visitor's browser or mobile application. Same goes for PubNub's messages subscription. Combining both cloud services, you can easily build a high-end, real-time photo sharing application. The flow is quite straightforward - use Cloudinary to allow your users to upload as many images as they want to the cloud and then send a message through PubNub to notify all other relevant users about these newly uploaded images. Recipients can ask Cloudinary to generate a scaled-down, cropped version of the original image to match their specific device and get that image delivered efficiently for best viewing experience. All this can be done without any complex coding, complex deployment setup or CPU load on your side. You can focus on your core application while Cloudinary and PubNub take care of all your media handling and communication channels. The following frame shows a live demo of a basic photo-sharing web app built using Cloudinary and PubNub. Try it out! Upload an image to Cloudinary directly from the browser, select a simple graphical effect to apply on it and share the photo using a PubNub message with all other users that currently view this page. See this in action by opening two desktop browsers or mobile devices simultaneously. All viewers subscribe to a single PubNub channel directly from the browser and display dynamic thumbnails and full size images, as they are being uploaded by all the other viewers. A robust, highly scalable, highly available, feature rich real-time photo sharing application, with just a few lines of code. Cool, right? We used a thin Ruby server (Sinatra) for this demonstration. In addition to Ruby, Cloudinary and PubNub also offer integration libraries for PHP, Ruby on Rails, Python & Django, .Net, Node.js, iOS, Android and others. 1. First we embedded a file input field in the page. This field includes a signature generated on the server side for authorizing secure uploading to Cloudinary from the browser using Cloudinary's jQuery plugin. The following Ruby code embeds a signed input field. For more details see this post. The :transformation parameter in this example applies an incoming transformation before storing the image in the cloud. The specific incoming transformation we've used limits the image size and adds a watermark. In addition, custom styles for the input field and drag area as well as the uploading progress bar are implemented using CSS and jQuery (see source code). 2. When the user clicks on the Share button, an Ajax request with an identifier of the photo is sent to the server which securely publishes a message to our shared PubNub channel. If you browse through this live demo's source code, you will notice that the few code lines listed in this blog post are actually almost everything you need to build your own, live photo sharing application. PubNub's service was built by developers that understood that developers should use a fully featured and scalable solution for real-time notifications instead of trying to build one by themselves. Same goes for Cloudinary's service - developers should use a fully featured and scalable image management, manipulation and delivery service instead of spending precious time building one themselves. Using both cloud-based services you can build complex, modern applications quickly, focus on the core of your application’s business logic and stop worrying about media management and communication channels anymore. 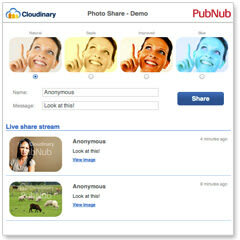 You can sign-up for a free PubNub account and a free Cloudinary account. This demo is just one, simple example. It would be great to hear your feedback and learn about your own ideas in the comments thread below.